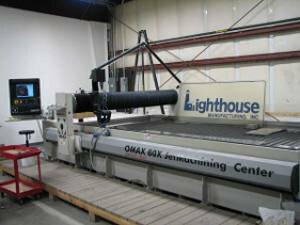 Lighthouse Manufacturing is a metal fabricator, utilizing machining and progressive die manufacturing with a reputation based on honest friendly customer service, superior quality and absolute reliability. Lighthouse fabricates and assembles a large variety of precision parts and tools from high-temperature alloy steels and exotic metals including titanium, Inconel, CobaltL605, Rene and High Speed Steel. Lighthouse maintains an extensive Materials Inventory for rapid shipment to the Aircraft, Aerospace, Automotive, Lighting and Power Generation industries. Major customers include General Electric, General Dynamics and Honeywell. Based in Portsmouth, New Hampshire Lighthouse operates out of a 42,000 square foot facility fully equipped with the most current and efficient metalworking technology. With its highly experienced, client-motivated staff and total company focus on product quality and customer satisfaction, Lighthouse makes it happen. © 2003 Lighthouse Manufacturing, LLC. All Rights Reserved.